It was cloudy and rain was in the forecast but at 18 degrees it was quite comfortable. We parked at the Barber Paper Mills and started to hike north up the east side of the Credit River. A blue marked side trail, part of the Bruce Trail, runs for 12 km between here and Terra Cotta. With the sky turning black we decided that maybe the weather man was right and getting caught in the rain would be better left for a warmer day. 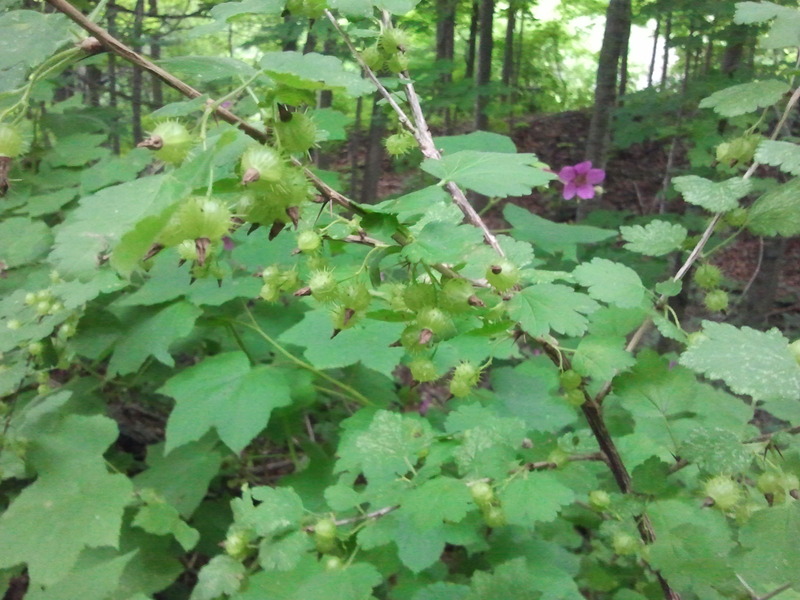 Along the trail a small patch of Gooseberries are growing. Gooseberries are related to the currant family and were valued in the middle ages for their cooling properties in fevers. They are currently harvested for jams and preserves. The story of Glen Williams is very much the story of the Williams family. Benajah Williams arrived in 1825 and built a saw mill and a flour mill on the Credit river in what would become known as Williamsburgh. He was born in 1765 in New York but as a staunch Loyalist he emigrated to Upper Canada. The Williams family supplied all the services that a rural community needed with Joel being the blacksmith, David the tanner, Isaac made cabinets, Jacob ran the Glen Woolen Mill and Charles had a general store and was first postmaster. 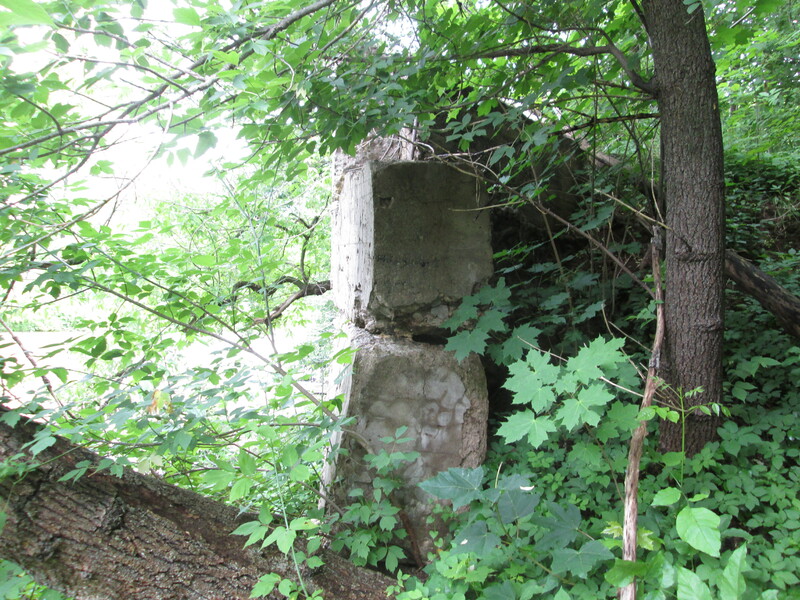 The Glen Woolen Mill was a town fixture until it burned down in 1954. Benajah’s original sawmill was built in 1826 and, along with his flour mill, formed the nucleus of the community. In the 1850’s he replaced it with the current mill. It operated as a water powered saw mill before being converted into a hosiery factory and finally serving as an apple processing plant. It belonged to Rheinhart Vinegars at the time of it’s closure in 1985. It was restored in 1989 and painted yellow earning the nick name “The Yellow Mill. Benajah passed away in 1851 leaving Charles to run much of the town’s industry. Beside the Yellow Mill stands the old stone building which housed the Georgetown Electric Light Company. The two structures are shown together in the cover photo. 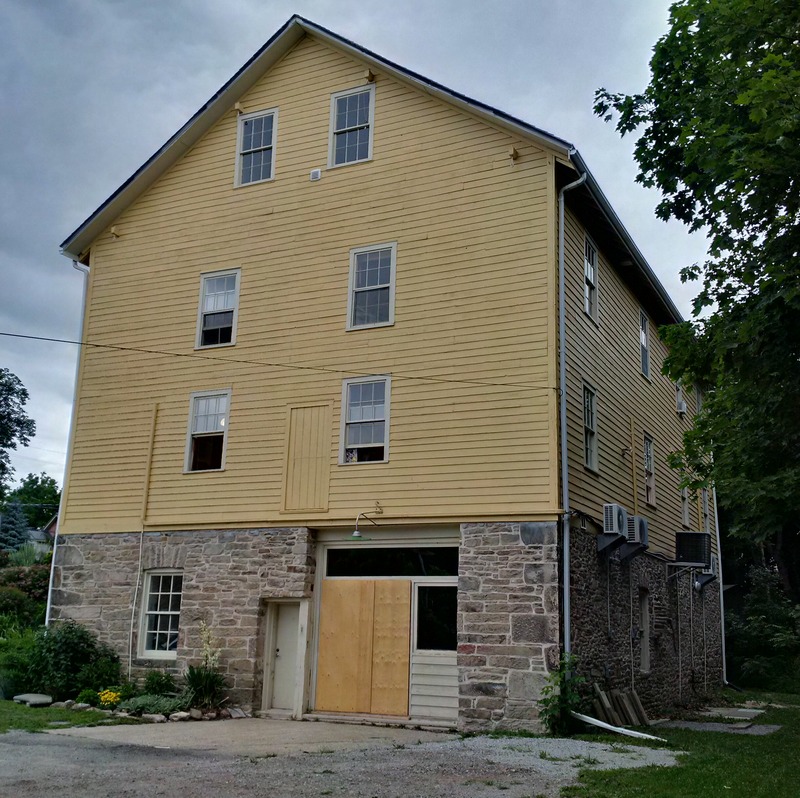 This two and a half story building was erected in 1893 on the foundations of the grist mill. 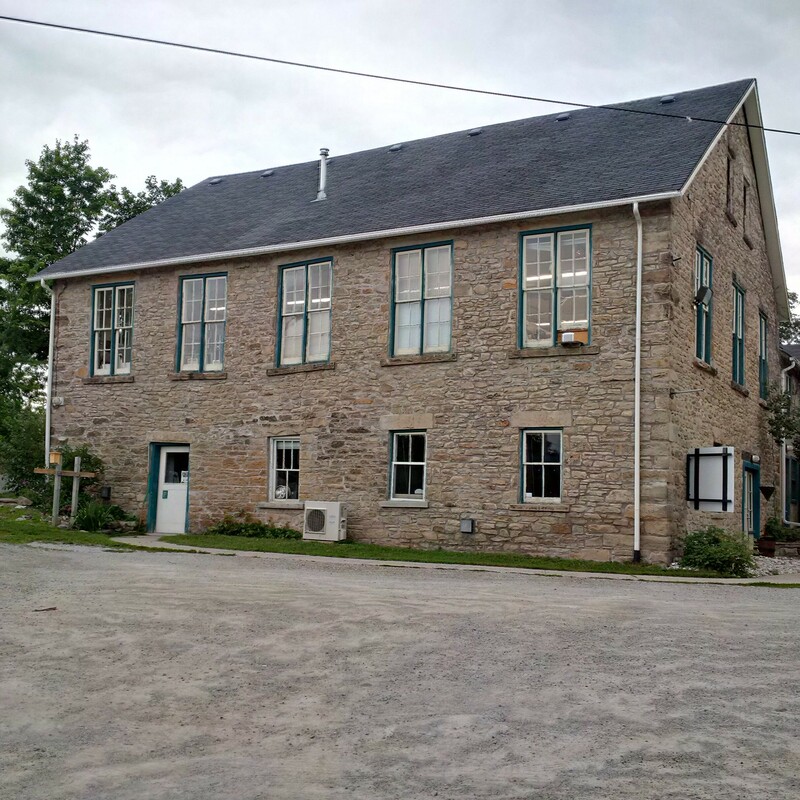 It provided electricity to Glen Williams for 20 years until 1913 when hydro was brought from Niagara Falls. At this time both it and the Barber Dynamo a few km downstream were shut down. It is an interesting building because the stone mason didn’t take the time to level the windows and so they slant on various angles. Charles Williams opened a general store and post office in 1852. When he applied for a post office licence it was refused on the grounds that there was already a post office in another town called Williamsburgh. Charles settled on the name Glen Williams after the little glen in which the town sat. The building was recently home to The Copper Kettle but is presently under renovations. The Good Templars approached Charles Williams in 1870 asking for a piece of land on which to build a town hall for the community that they could also use for their temperance meetings. Charles deeded them the town lot adjacent to his General Store. 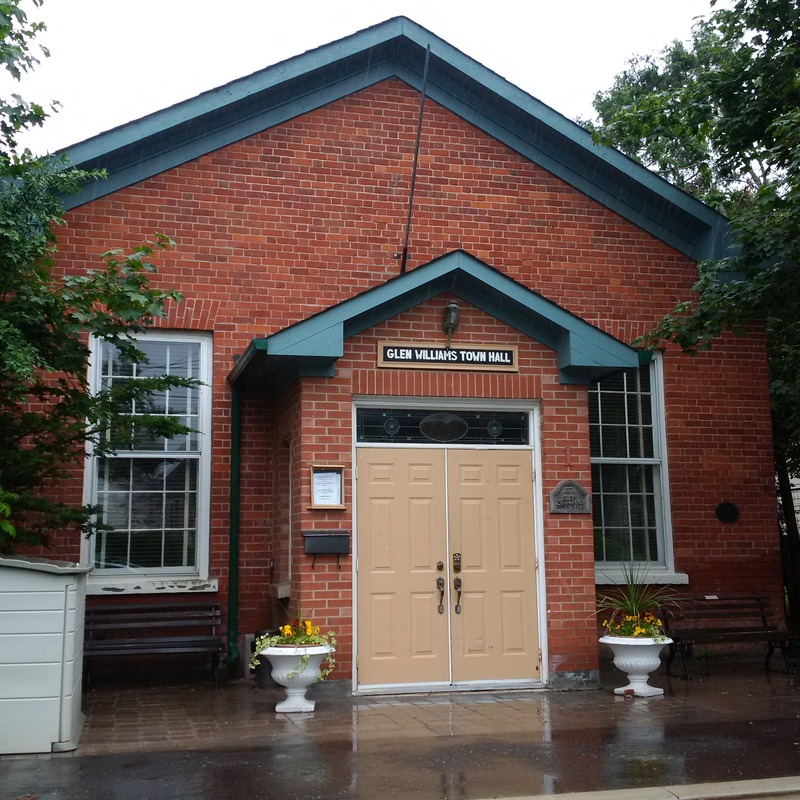 The town hall was built in 1871 and has served the community in many capacities including as a stage for Canadian author Lucy Maud Montgomery to perform dramas. On the corner opposite to the town hall stands two connected buildings. The first is the home of James Laidlaw who built it in 1858. 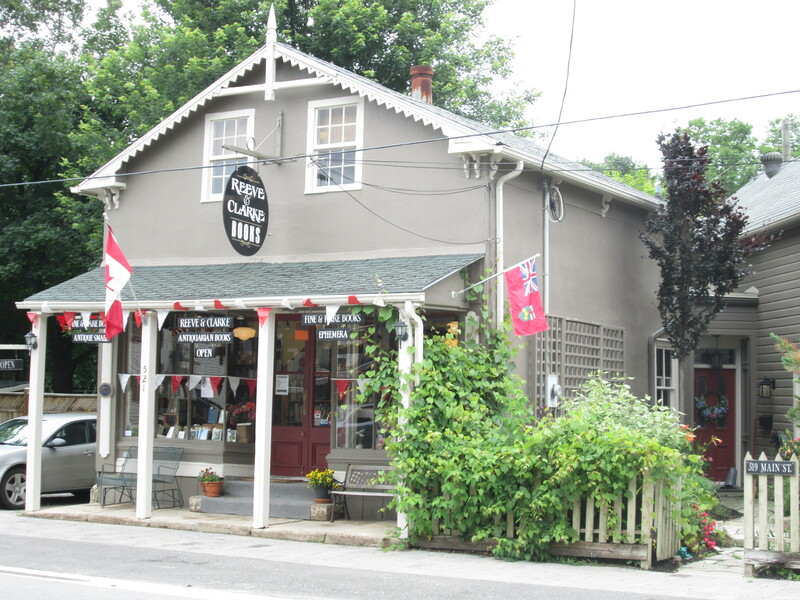 The building beside it belonged to the local tailor Thomas Frazier who operated his shop here starting in 1847. Later it belonged to Laidlaw who ran a store here. Timothy Eaton was a clerk in this building in 1853 and 1854 starting when he was 19. Timothy would go on to found Eaton’s Department Store. Benajah Williams and his family were Methodists and the first services in town were held in 1836. 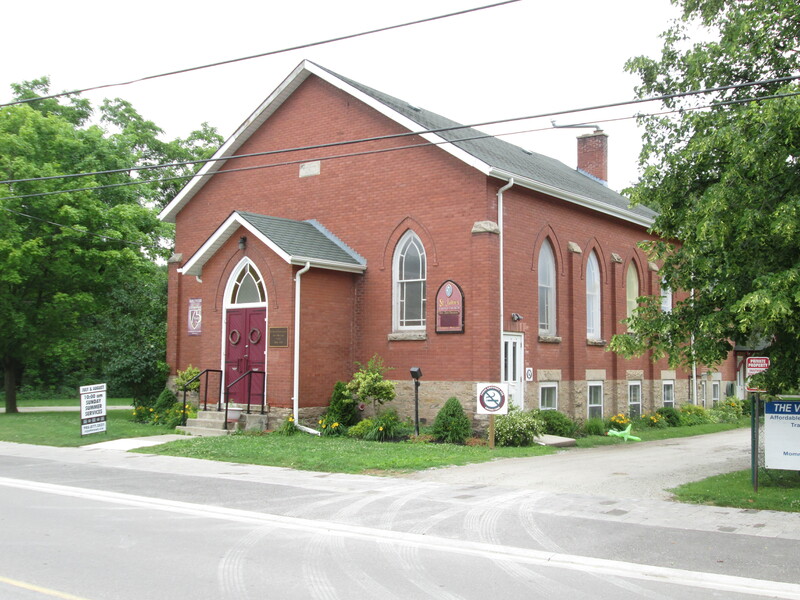 The frame church was built in 1837 and given a veneer of bricks in 1903. 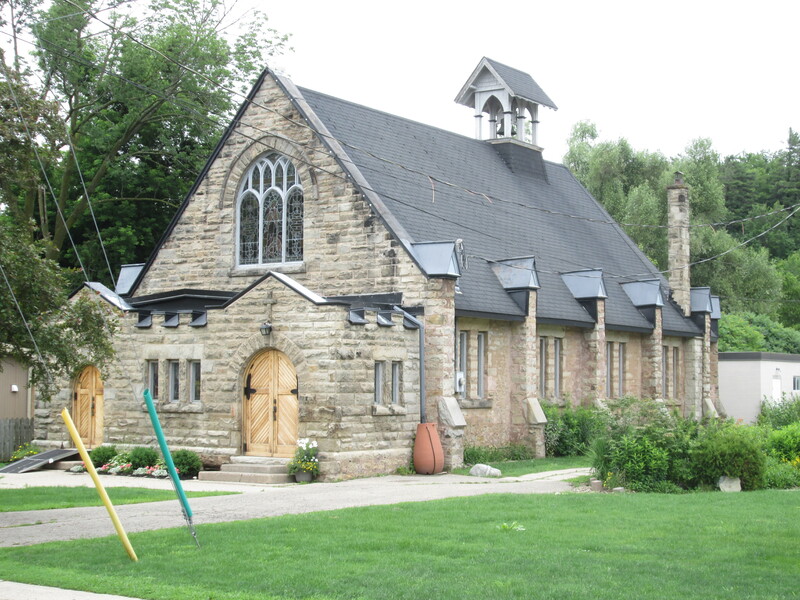 This church stands on one side of the Credit River. On the opposite bank stands the St. Alban The Martyr Anglican Church. It has an interesting shape with the bell tower at the rear instead of the front by the street. The first services held in this building were in June of 1903. I wonder if the Methodists decided to give their church a facelift of bricks in response to the construction of the Anglican church. These two churches stood on either side of the Glen Williams mill pond. The mill dam stretched between the two churches until it was destroyed by a flood in 1950. Glen Williams has been subject to much flooding over the years with major floods in 1912, 1930, 1964 and 1965. Remanants of the dam can be seen on both sides of the river. On the north end of town Joseph Tweedle operated a saw mill in the 1860’s. 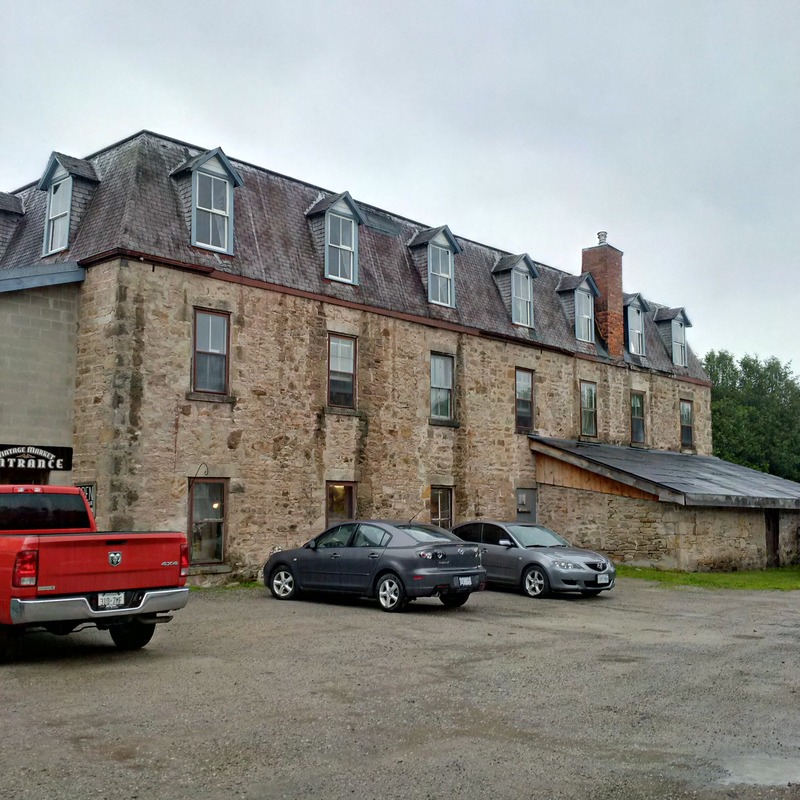 In 1872 Richard Hurst replaced the saw mill with the large stone structure that stands here today. In 1882 it was purchased by Samuel Beaumont who opened the Beaumont Knitting Mills. Products from the mill included blankets, socks and mittens. This mill at one time competed with Jacob Williams Woolen Mill and Benajah Williams hosiery factory in a local hub of the textile industry. Having previously teased you with teasles in the Barbertown post I thought it fitting to post a picture of the young plant as it starts to open. 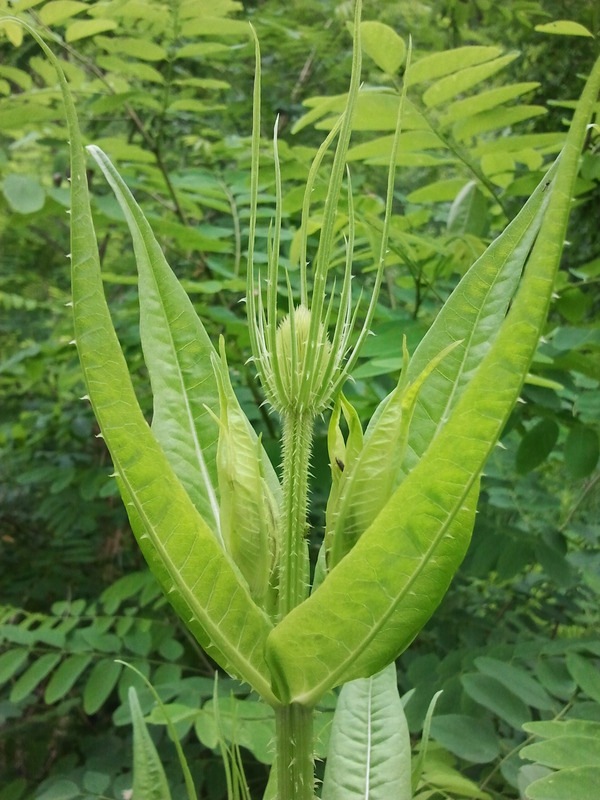 Later in the season it will bloom with a purple ring but for now it looks more like it belongs in a movie about an invasive species of plant from outer space. Thanks to my brother for providing some of the pictures in this post. He’s the guy who puts the “we” in “we”. Visit us at http://www.facebook.com/hikingthegta for additional photos. 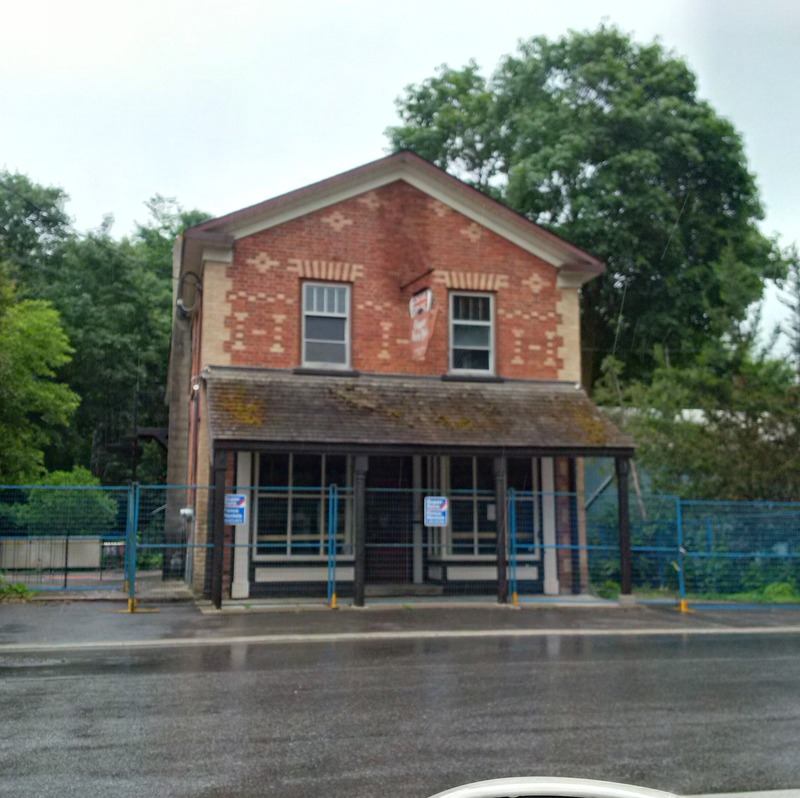 This entry was posted in Credit River, Uncategorized and tagged Beaumont Knitting Mills, Georgetown Electric Light Company, Glen williams, Gooseberry, Teasel, The Yellow Mill on June 30, 2015 by hikingthegta. There used to be an annual spring time “Crazy Boat Race” on the Credit River that would start at 22nd Sideroad (Main Street in Glen Williams) and 10th Line and end at the park near Main and Confederation. The first creation to get across the finish line was the winner, or the one that went furthest. There were also canoe and kayak classes. Sometimes people had to be rescued after canoes and creations capsized or sank. We lost a fibreglass canoe one year. My mistake above. The Crazy Boat Race ended at Norval. The race was over for a family member and friend near Glen Willams Park after the canoe “ capsized” ( it shot straight up in the air before returning to the river, upside down) and was taken downstream by the river. My sibling and friend had to be rescued from an island in the Credit. There was a lot of water flowing in the spring floods back then ( mid 1970’s). We lost that canoe, but saw it again years later in Norval. Whoever found it, repaired it. It was a distinctive looking canoe being a FEMAT whitewater touring canoe.